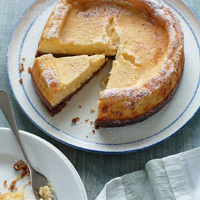 Remember to allow chilling time when making this baked cheesecake. Preheat the oven to 170c, gas mark 3; grease a 21cm springform cake tin. For the base, whiz the biscuits to crumbs in a food processor, then pulse in the muscovado sugar and butter. Press firmly into the base of the tin and chill. Beat the mascarpone and cream cheese until smooth. Mix in the cream, sugar, lime juice and zest, vanilla seeds from the pod, and the 3 egg yolks. In a separate bowl, whisk the egg whites until stiff. Stir a large spoonful of this into the cheese mixture to loosen it. Gently fold in the rest of the egg whites and pour over the prepared base. Cook in the oven for 30 minutes, then turn the heat up to 180c, gas mark 4 for a further 20 minutes. Turn off the heat and leave the cheesecake in the oven for 1 hour to cool and set. Remove from the tin and serve, dusted with the icing sugar; or cover and chill in the tin overnight before serving.